Mooooooooove over Sydney, six piece party band, Mad Cow, are stampeding all over venues and function rooms across town! Recently nominated for a 2013 ACE Award (Aust Club Entertainer’s Award), the band is looking forward to their biggest year yet! Mooooooooove over Sydney, six piece party band, Mad Cow, are stampeding all over venues across town, and trust me, no udder band can herd an audience onto the dance floor like these guys can! But, beware! They won’t stop short of using a cattle prod if they have to, and that’s no bull! 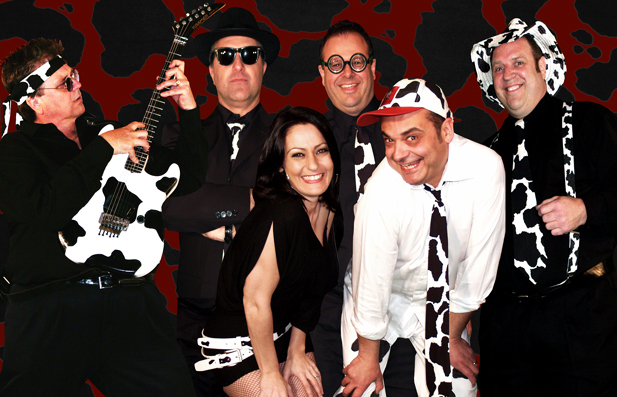 Established during the decade of the Naughties, Mad Cow has moooooved on to become one of Sydney’s most popular party bands. Recently nominated for a 2013 ACE Award (Australian Club Entertainer’s Award), the band is looking forward to their biggest year yet! Mad Cow are infectious, madcap, energetic and determined to grab the bull by the horns when it comes to ensuring their audiences are thoroughly entertained all night long. Showcasing chart hits from the 60’s through to today’s favourite tunes, Mad Cow inject tons of humour as they feature some of your favourite artists and songs. Visually entertaining, Mad Cow are tons of fun, incorporating props and take offs such as pom pom twirling Toni Basil and school boy legend, Angus, who was ironically named after a famous breed of Aberdeen cattle! Fronting this nutty line-up is the zany and animated lead singer, Tony T-Bone, who shares the lead vocals with the sexiest cow in the paddock, Daisy Tenderloin. Completing the Mad Cow line-up is Barry Bovine (drums/vocals), Chuck Steak (keyboards), Eddie Van Ham-burger (guitar/vocals) and Jake Jersey (bass player). 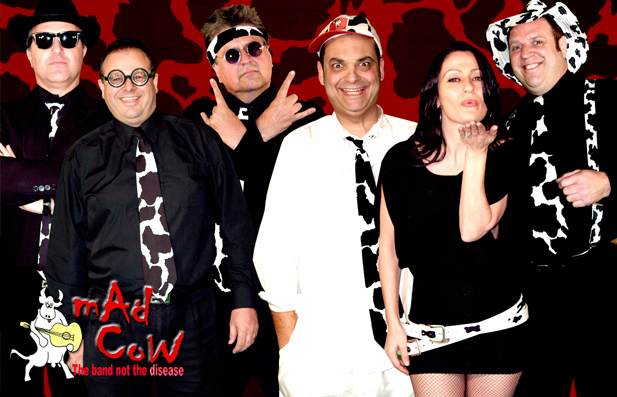 Mad Cow – A band like no udder! celebrating Blaxland Football Club's 40th anniversary. that extra mile to accommodate our needs on the night. all of the guests that I spoke to were still raving about them the next day. The name "Mad Cow" will not be easily forgotten in the Blue Mountains. at our Mathematics Association of NSW Conference." "Just a short note of thanks to Mad Cow. You were absolutely great and really made the party. I think everyone was pleased to see you guys up in action. Well Done." "We had an amazing night, everything went to plan. Mad Cow were sensational, full of energy and a great selection of songs. They worked around our schedule which made life very easy. Thanks for your assistance in making our Club's 50th anniversary memorable."